WHAT ELSE CAN I EXPECT FROM AN ONLINE BACHELOR'S IN MATH EDUCATION? Mathematics is a cornerstone of the U.S. education system. Exposure to math begins in preschool and kindergarten, when children are taught the basics of arithmetic and geometry. As they grow and progress in their education, students also introduced to increasingly complex concepts related to algebra, trigonometry and calculus. College and university students who pursue degrees in math will master advanced algorithms and theories that prepare them for careers in physics, information technology and other cutting-edge fields. Throughout this learning process, math teachers will serve as the guiding voices. The majority of these teaching professionals begin their careers at the undergraduate level by earning a bachelor's degree in math education. In addition to four years of comprehensive coursework, another key component of bachelor's math education degree programs is student-teaching; this involves visiting a working school classroom and assisting teachers with various classroom needs, while also receiving supervised training from experienced educators and administrators. Bachelor's in math education programs also prepare students to earn a teaching license, which is required at all public schools ― as well as many private schools ― in the United States. Many of today's students are choosing to earn their bachelor's degree in math education online, rather than in a classroom. Web-based students follow the same rigorous curriculum as their brick-and-mortar counterparts, often leading to the same number of post-degree job opportunities. The asynchronous (or self-paced) format and flexible, study-from-home schedule are ideal for students with part-time jobs, childcare duties and other important commitments. Learn more about what you can do with an online bachelor's degree in math education and what kind of career opportunities you can look forward to with this comprehensive guide. WILL AN ONLINE BACHELOR'S IN MATH EDUCATION PROGRAM PROVIDE ME WITH THE SKILLS I NEED TO ADVANCE MY CAREER? A bachelor's degree is considered the minimum educational level for most math teaching positions at elementary, middle and high schools in the U.S. As such, the curricula of these programs will emphasize three focal points: mastery of various mathematical schools, modern curriculum standards and a clear understanding of the classroom dynamic. Student-teaching experiences also give students the chance to apply the skills, knowledge and insights they have gained to real-world classroom issues. Most bachelor's in math education programs include preparatory coursework for licensing exams, as well. WILL AN ONLINE BACHELOR'S IN MATH EDUCATION PROGRAM WORK WITH MY SCHEDULE? Online bachelor's degree programs offer a flexible, easily accessible alternative to traditional higher learning. Students are able to download course lectures and readings, participate in virtual discussions with other students, submit written assignments, take exams and communicate with their professors from the comfort of their home computer. Current technology also enables them to study on the go using a laptop, tablet, smartphone and other portable devices with Wi-Fi capabilities. For added convenience, students can usually coordinate student-teaching opportunities at schools that are reasonably close to their current residence. WHAT JOBS CAN I GET WITH MY BACHELOR'S DEGREE IN MATH EDUCATION? Students who leave school with a bachelor's degree in math education and obtain a teaching license will be well-positioned to compete for jobs. Most bachelor's programs allow students to focus on teaching older students, which enables them to seek jobs at middle and/or high schools. Math teachers at the university level must have a master's degree or higher, but the bachelor's pathway can serve as a stepping-stone for students who plan to advance to a graduate program. WHAT ARE THE BEST ONLINE BACHELOR'S IN MATH EDUCATION PROGRAMS? Choosing a program is an incredibly personal decision, and only you can properly evaluate whether a target school's strengths match your educational needs. 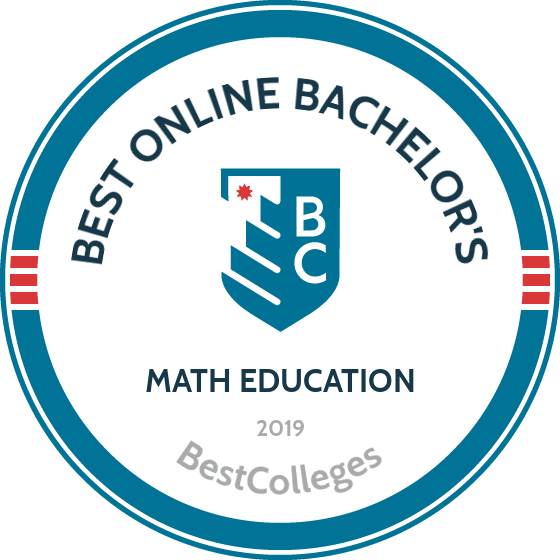 The following ranked list of schools should serve as a helpful starting point in your search for the best online bachelor's degree in math education programs in the United States. Our ranking is based on the courses schools offer, available specializations, student outcomes, career support services, and other criteria used to determine academic excellence. If you are considering an online bachelor's in math education, be sure to contact admissions specialists at different colleges and universities to learn more their about specific requirements and offerings. WGU was established in 1995 by 19 governors seeking to break the mold of higher education. The result is an online, competency-based and student-focused institution that harnesses technology to help working professionals earn their degree. WGU features extensive undergraduate and graduate online offerings in the fields of education, business, information technology, and health care. The university's 100% online bachelor's of arts in mathematics is designed for teachers in grades five through 12 who are seeking licensure to improve their employability for math education jobs. Course topics include calculus, geometry, algebra, instructional strategies, classroom management, and math learning and teaching. To graduate, students must complete 122 credits. Those who already have an associate degree can earn this math education degree within 2 ½ years, while those who lack any college experience typically finish the program within five years. WGU does not require a minimum GPA or SAT/ACT scores for admission to its math program. Since 1972, New Hampshire's Granite State has fulfilled its vision of providing students with learning opportunities no matter where they live or how much they earn. The college boasts a range of distance learning options, and more than 77% of its students take classes online. Granite State offers online undergraduate and graduate degrees in fields like education, health care, technology, and liberal arts. Eligibility for these programs varies by state. Granite State's 100% online bachelor's of arts in math studies with teacher certification options includes liberal arts studies facilitating a pathway into education. Course requirements vary depending on certification pathway, choices of which include elementary education and general special education, mathematics (grades 5-8), and mathematics (grades 5-8) and general special education. Those not pursuing certification in this online education degree in math take courses in areas like critical inquiry, statistics, integrative math studies, scientific inquiry, and arts and humanities. Located in Kentucky, Midway is a liberal arts institution offering career-focused degree programs in fields such as business, education, psychology, and pre-professional programs. Online degree programs are offered in an eight-week, accelerated format available five times a year in fields such as business, healthcare, and sports management. Midway uses Moodle to deliver its 120-credit bachelor's in education studies with a math emphasis, designed for students not seeking certification, those who seek paraprofessional positions in schools in the U.S., and those planning to pursue a master’s in math. Studies in the major include classes on topics like middle school education, technology in the classroom, foundations of literacy, and multicultural education. Courses in the math emphasis include algebra, finite math, and calculus. Midway's math education degree is 100% online and affordable, and 90% of students receive some form of financial aid. Founded in 1889, Mayville is a small institution of about 1,100 learners pursuing associate and bachelor’s degrees on campus and through the university's online courses, designed to feature student-focused instruction and a maximum class size of 20 students. Mayville's eLearning programs range from education and nursing to university studies and business management. The school intends its 100% online bachelor's of science in mathematics education for students seeking to teach math at the secondary level. The 125-credit cohort program, which begins only in the fall, typically takes eight semesters, or three years, to complete. Course content in Mayville's online bachelor's in math education includes algebra, calculus, and trigonometry, as well as secondary education studies in special education, student teaching, and learning theory. The university also delivers a number of minors fully online, in areas like special needs, business, computer information systems, and general science. For 50 years, IRSC has demonstrated a strong commitment to student success and boasts high degree completion rates. The college delivers more than 150 undergraduate degree, diploma, and certificate programs in a range of disciplines. IRSC offers 12 programs fully online, including a bachelor's of science in education that features options to specialize in middle grades math and secondary math. The curriculum of IRSC's online math education degree includes history of math, geometry, classroom management, ESOL principles and practices, and instructional strategies. Students have the opportunity to engage in local practicums working at math teacher jobs. Each online course requires students to take at least one proctored exam. IRSC emphasizes the rigor, convenience, and affordability of its degree programs. To be eligible for admission to the online bachelor's in math education program, applicants must have an associate degree and must pay a $30 fee. The coursework of a bachelor's degree in math education program will be divided between two core areas: mathematics and fundamentals of teaching. For math subjects, students should expect courses in geometry, trigonometry, calculus, linear algebra, math theory, discrete math, statistics and probability. Teaching courses will focus on niche topics like special education and education of gifted students, classroom management, curriculum and development, educational laws and ethics, child psychology and behavioral studies. Student-teaching courses will also fall under this category. A large number of these bachelor's programs allow students to specialize in middle or high school instruction, since these institutions typically have dedicated math teachers who exclusively lead classes in math-related subjects. Those who plan to teach at the elementary level typically do not need to follow a specialized math education pathway, since elementary teachers are responsible for instructing all subjects (including math) and most elementary students are not mentally ready for advanced math lessons. It's important to research the accreditation status of a bachelor's in math education degree program before fully committing to it. In the U.S., online math education bachelor's programs receive accreditation from the Council for the Accreditation of Educator Preparation (CAEP). In addition to programmatic accreditation, make sure that the college or university has received regional or national accreditation. Due to a widespread need for qualified teachers and steady job growth across the education system, the job outlook is quite favorable for students who graduate with a bachelor's degree in math education. Unemployment rates for math educators will largely depend on which grade level they teach. The table below looks at unemployment estimates for three school types. As the table indicates, high school teachers face better unemployment odds than their counterparts at elementary and middle schools. However, the unemployment rates for all three occupations fall well below the national unemployment average for all industries, which is currently set at 4.7%. Much like their job outlook, the salary potential of degree-holding math teachers will vary by the type of institution where they work. Their employment destination is often tied to their undergraduate major. Using data from the 2016-17 PayScale College Salary Report, the following table looks at earning expectations for different education majors at two early career benchmarks. In addition to bachelor's degree major, the salary potential of a math teacher will also depend on the type of school where they teach. Other important factors include licensure status, experience level and city/state of employment. The next table looks at career salary growth expectations for four common career paths for math education master's recipients. All four occupations experience similar rates of salary growth after 20 years on the job. Middle school teachers reported the highest growth rate: a 49.2% increase in earnings between the entry-level and late-career stages. Elementary school teachers ranked second (despite having the lowest salaries) with 47.4% salary growth, followed closely by mathematics teachers with 46.7% growth. Those who earn a bachelor's in math education and obtain a teaching license will be qualified to work at public and private schools across the country. Three popular career pathways among math education bachelor's recipients are highlighted below. High School Teachers: At the high school level, math teachers typically lead dedicated classes in subjects like algebra, geometry, trigonometry and calculus. They may also oversee math-related clubs, activities and events on school grounds. Middle School Teachers: Middle school math teachers typically lead lessons in fractions and decimals, calculating percentage, measuring area and volume, and other intermediate math subjects. They may also teach low-level and advanced classes for special education and gifted students, respectively. Kindergarten and Elementary School Teachers: Basic mathematics are taught beginning in kindergarten or preschool, and teachers help students grasp these concepts throughout their elementary education. Common class subjects include addition, subtraction, multiplication, division, and shape identification. Making professional connections and learning about different approaches to math education is crucial to your success. Professional organizations offer a great entry point for students who want to learn more about their chosen career path. Below you'll find three of the country's most prominent organizations established for math teachers and other education professionals. These organizations host networking events, provide online trainings, maintain active job boards, and offer other services for career-ready college graduates. Resources like these often prove invaluable as you complete your degree requirements and prepare to enter the job market. The National Council on Teacher Quality: This organization works to create policies that improve the quality of classroom education and the work environments for professional educators. The council's website features an extensive policy library, as well as information about various NCTQ projects in all 50 states. Association of Mathematics Teacher Educators: The AMTE currently boasts more than 1,000 members working at all grade levels. Membership rates are offered for working and retired teachers, as well as students pursuing math education degrees at the graduate level. National Council of Teachers of Mathematics: Considered the world's largest organization for math educators, the NCTM was founded in 1920 and today boasts more than 60,000 members across the globe. The council awards grants and awards to qualified recipients, hosts an annual conference and offers professional development courses for aspiring and working math teachers. Despite the relative affordability of online bachelor's degree programs, most students still need financial assistance. Students should complete a Free Application for Federal Student Aid (FAFSA) form to learn more about loans, grants, and other opportunities offered through the U.S. government. Additionally, private grants and scholarships are widely available through nonprofit organizations, companies, and other sources. Check out our collection of resources below to learn more about financial aid options.